The Venus of Willendorf is a prehistoric goddess figurine. Archaeologists believe that she was carved in 25,000 BCE, distinguishing her as one of the earliest artifacts depicting the earth mother--and one of the oldest artifacts ever found. The Venus was discovered in 1908 at a Paleolithic site near the village of Willendorf, Austria. Art historians believe that these little hand-held sculptures--they uncovered multiple Venuses--were important during the Paleolithic era. The ancient nomads carried the fertility goddesses everywhere they went. Because I dedicate my life to the arts, and because she is the oldest image of art, female power, and spirituality, I chose the Venus of Willendorf as the name of my company and as the centerpiece of my last two prospects. I began going into the swamp two years ago, a particular swamp called Talisheek Creek in Bush, Louisiana. Amazing vegetation grows here: Cypress and Gum Trees stand in the water like powerful, wise beings. In the wilderness, I feel like I am in the presence of primordial energy. I want to be there, among these ancient earth mothers. I gathered the bark used for my installation, Wisdom of the Swamp Goddess Prospect 4, on land owned by people I have come to know in the woods and wetlands of Pearl River, Louisiana. 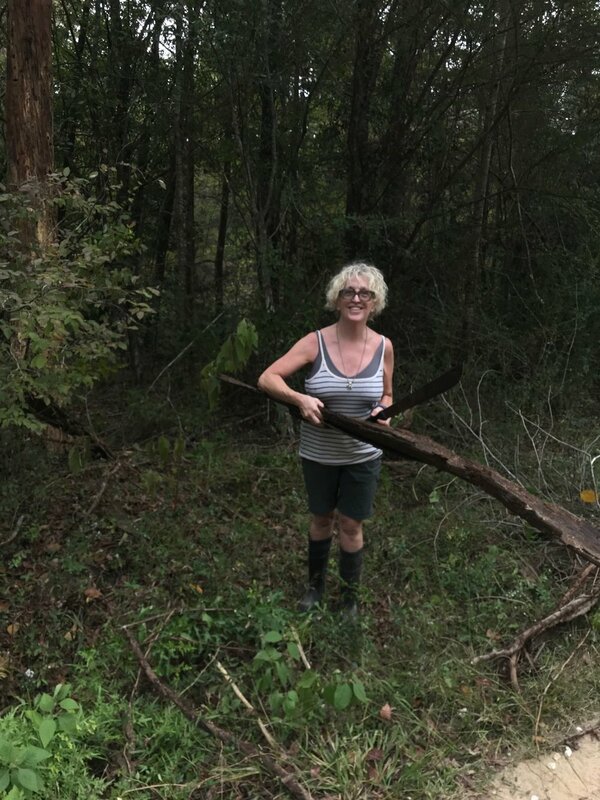 I used a machete to peel the bark off long fallen trees (in order for the bark to slip off easily, the trees must have already been felled for several months –no trees were harmed in the making of Wisdom of the Swamp Goddess!). The cypress bark is thin, fibrous and malleable, whereas the sweet gum is thick, brittle and breaks easily. One of our greatest challenges throughout the project was figuring out a way to mold the bark together to create the goddess of the swamp trees. As in every creative process, we tried many different things along the way to find what works. I put my dilemma out into the world. 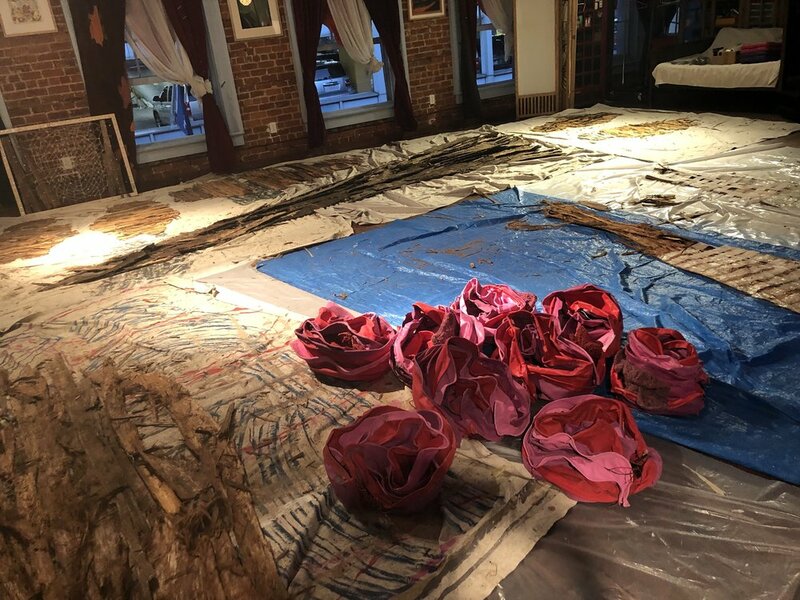 With the help of many creatives including the mixed-media artist Tony Savoie, we conceived a technique using fibrous sheet rock tape and Loctite adhesive. Combining these materials, we created trees surpassing our imaginations. I felt like I was channeling some other energy. I believe that nature does everything with effortless ease- if we practice a level of acceptance, we can tap into this elegant and effortless creative process. I did not know what I was doing, but I kept moving forward -letting things be, not forcing solutions, embracing uncertainty, and combining those things together. I kept thinking "I’m not sure how I’m going to do this”, but allowed the method and the creative process to flow. 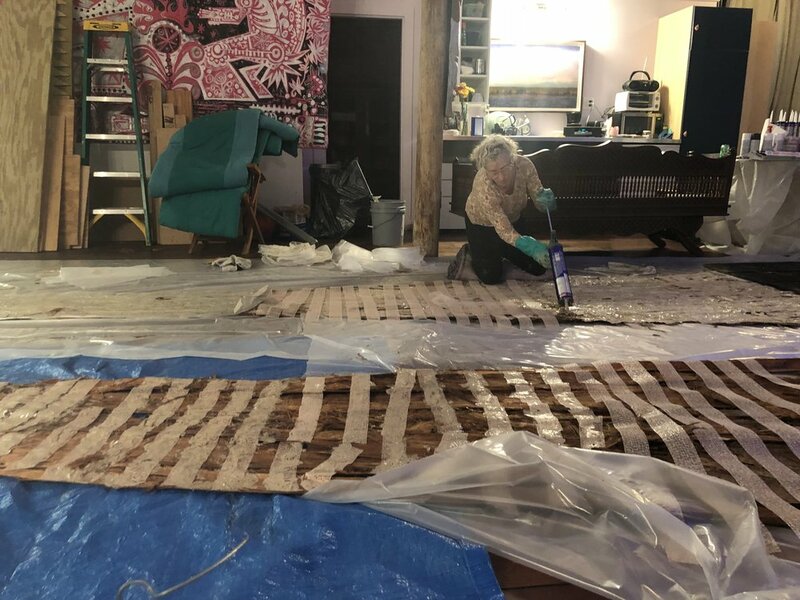 Commencing the installation process, we first brought all of the bark upstairs to the third floor studio space. We laid the strips face-down. Then, we adhered the bark together and created tree forms. They were ten, fifteen, or twenty feet long, between five to eight inches wide. 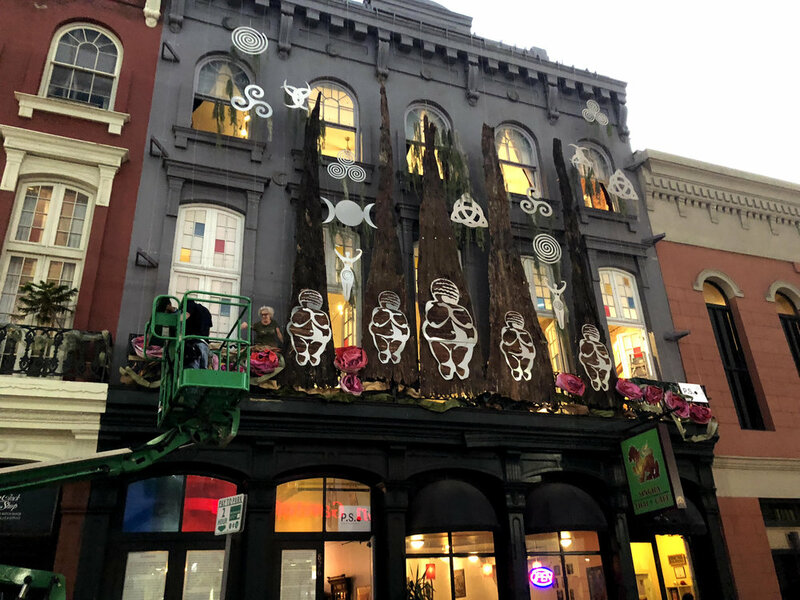 The next step was lowering the trees out the window by ropes to the ground level; here, we reinforced them with wood and hardware, readied them for installation. As a web of support, we attached a steel rope armature to the front of the building. The entire installation is wired or bolted to this web, attached at the parapet wall above and to the hand rail below. Easily, effortlessly, this structure supports over 500 pounds! We rented a boom truck for ten days. 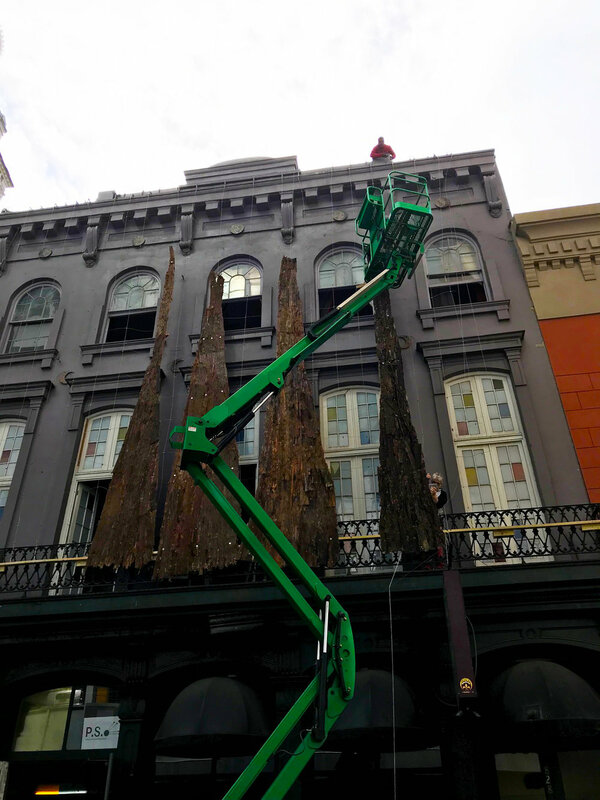 All day, every day, we raised trees up onto the façade of the building and secured them to the web of support.